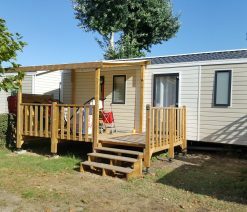 Eleovic has mobile homes to rent: 1-bedroom 20m2 mobile home for 2-3 people, 2-bedroom 27m2 mobile home for 4-5 people, or 2-bedroom 23m2 mobile home for 4 people, 3-bedroom 31m2 mobile home for 6 people and new quirky accommodation: the lodge on stilts overlooking the sea and the eco-lodge. 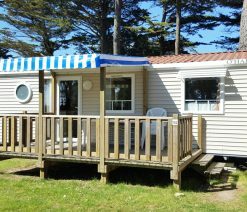 4-season lodge on stilts for 4-5 people, with incredible views over the sea, luxury 32m2 inside area, and a 10m2 wooden terrace. 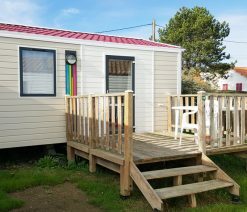 Check out our quirky accommodation! 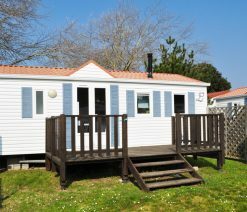 The eco-lodge is a furnished, good-sized tent-lodge with a covered terrace, suitable for 4 people. 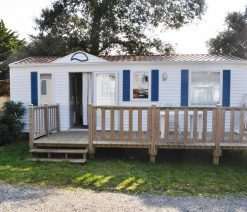 Quirky accommodation for a low price – ideal for trendy nature getaways. 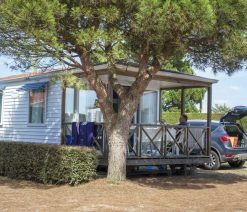 By choosing a mobile home rental for your holiday in Pornic in southern Brittany, you are choosing comfort and space without compromising on the campsite atmosphere. Some purists say it’s too far removed from proper camping, but let them grumble whilst you enjoy life’s pleasures in a mobile home rental. 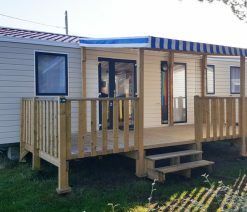 All of our mobile homes have a flat wooden terrace where you can have breakfast or drinks in the open air. If you’d rather stay indoors, you have all the comfort you need in your Pornic mobile home.